The Spotinst team had a blast at re:Invent this year! This was our fourth year attending, and it’s an incredible feeling seeing our booth, presence and market awareness grow from year to year. We owe it all to our amazing customers, who continue to push the envelope of the DevOps world. During re:Invent, we announced many new enhancements to Elastigroup, such as Global Spot View, new supported instance types and regions, and Showback for ECS. Most importantly, we launched Ocean! Here’s a quick recap of all the Spotinst announcements from re:Invent! 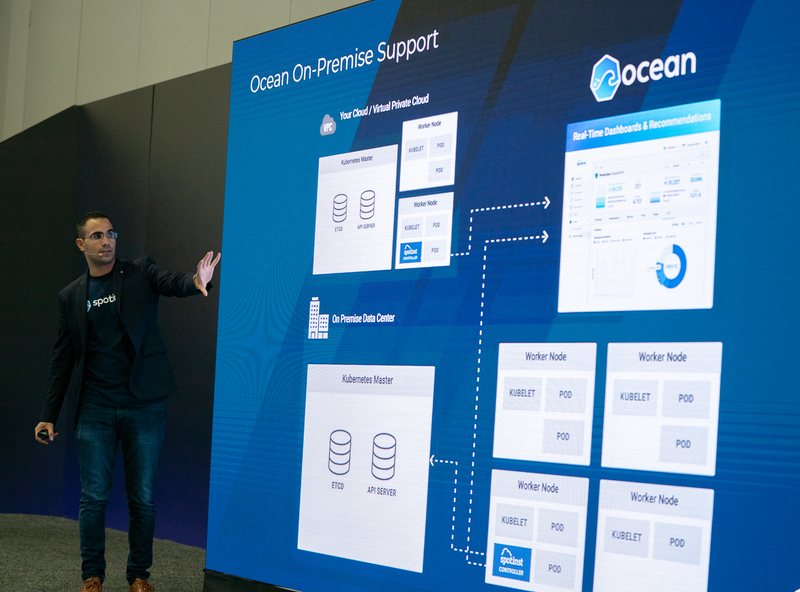 This year at re:Invent we were proud to announce our new product Ocean – the Serverless Kubernetes Engine. Ocean takes away the pains of scaling and managing containers and nodes in a Kubernetes cluster. With Ocean, you can forget about mixing and matching instance types and trying to figure out when and how to scale nodes in the cluster. Ocean automatically ensures your containers are placed on the best possible mix of Spot, RIs, and On-Demand instances – Optimizing your clusters for both cost, availability, and performance. Let’s explore how it works. Ocean improves on the foundation of our tried-and-true Kubernetes Autoscaler and provides pod-driven autoscaling for Kubernetes clusters. Ocean adjusts infrastructure capacity and size to meet pod, container, and application needs and makes sure that all pods in the cluster have a place and capacity to run. The icing on the cake is that beyond eliminating the overhead of maintaining and scaling infrastructure, Ocean significantly reduces costs by reliably leveraging excess capacity and automatically binpacking containers to ensure the most efficient use of infrastructure. Ocean recognizes when multiple containers should be placed on the same instance, or when they should spread out across a group. 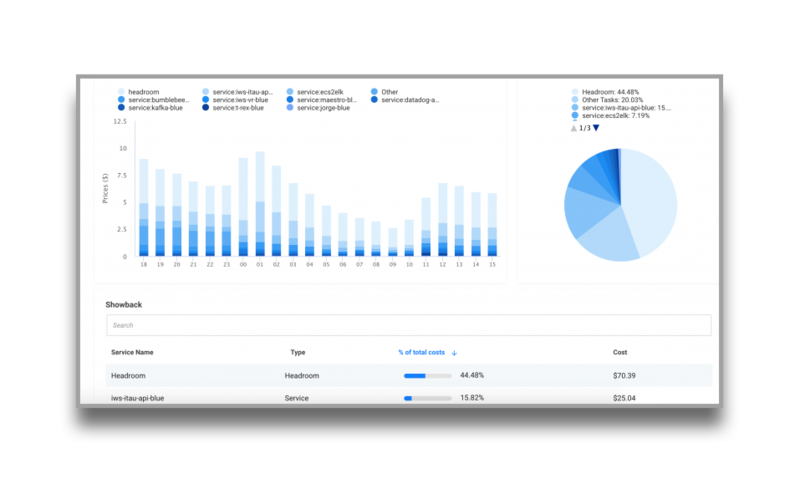 Ocean’s On-Premise feature lets you compare current costs with the estimate cost of running your Kubernetes clusters on the cloud. 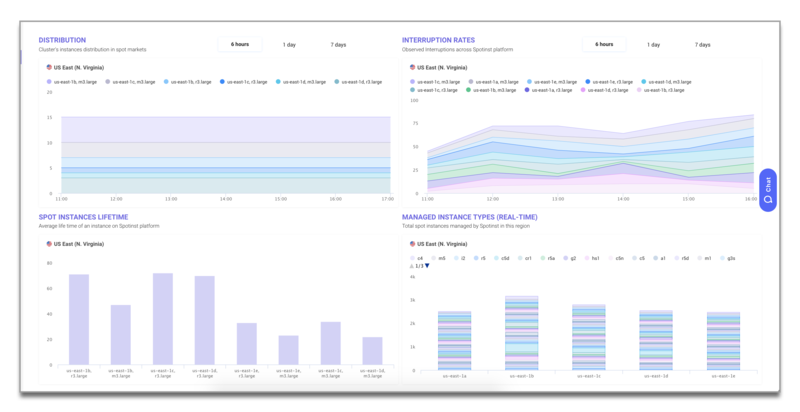 In addition to Ocean for Kubernetes clusters running on public cloud providers, we also announced Ocean On-Prem which gathers data from all monitored Kubernetes clusters, regardless of where the cluster is deployed. After analysis, Ocean provides a consolidated dashboard for clear visibility into all clusters. Utilizing Spotinst’s predictive algorithms, Ocean delivers recommendations on the most cost-effective deployment method for future workloads. With Ocean, your organization will gain deeper visibility and a reliable method for performing showback/chargeback on containerized workloads. Duolingo provides a free service that enables users to learn a language. At re:Invent, they had a great session about their journey to the cloud and how they used Spotinst to maximize their infrastructure efficiency and drive down costs. 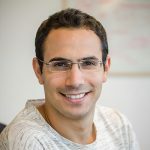 In the end, Duolingo was able to reduce their compute costs by 60%. Global Spot View gives you insight into the entire excess capacity market. With the release of the Global Spot View, you can easily see how your Spot instance distribution measures against the collective market and which regions have the most interruptions. This feature is great because it provides users with information to make smarter deployment decisions. Let’s see how it works in detail. The Global Spot View aggregates anonymous data from thousands of Spotinst users and gives you a high-level view of how the market is trending in terms of server distribution, Spot interruptions, the average lifetime of Spot Instances, and Instance Types. We recently added support for the new A1 and C5n instance types. The A1 instance types are optimized for performance and costs and powered by Arm-Based AWS Graviton Processors. A1’s are a great fit for scale-out workloads where you can share the load across a group of smaller instances. The C5n instance types are optimized for network and memory performance and powered by AWS-custom 3.0 GHz Intel® Xeon® Platinum 8000 series processors. C5’s have up to 100 Gbps of network bandwidth and is ideal for simulations, in-memory caches, data lakes, and other communication-intensive applications. In addition to supporting new instance types, we now support Beijing and Ningxia Regions in China for AWS EC2. When adding a new AWS account to Elastigroup, select “I’m using an AWS China account’ and proceed with the setup as normal to link your account. Once your account is linked, you will be able to take advantage of Spot Instances in AWS’s China data centers. Showback breaks down the costs of the cluster to uncover the costs of the underlying applications and understand the resource consumption of the various components. We recently extended this functionality to support AWS ECS clusters so organizations can better understand the costs of their workloads. ECS Showback gives you greater insight into the cost and utilization of your clusters. 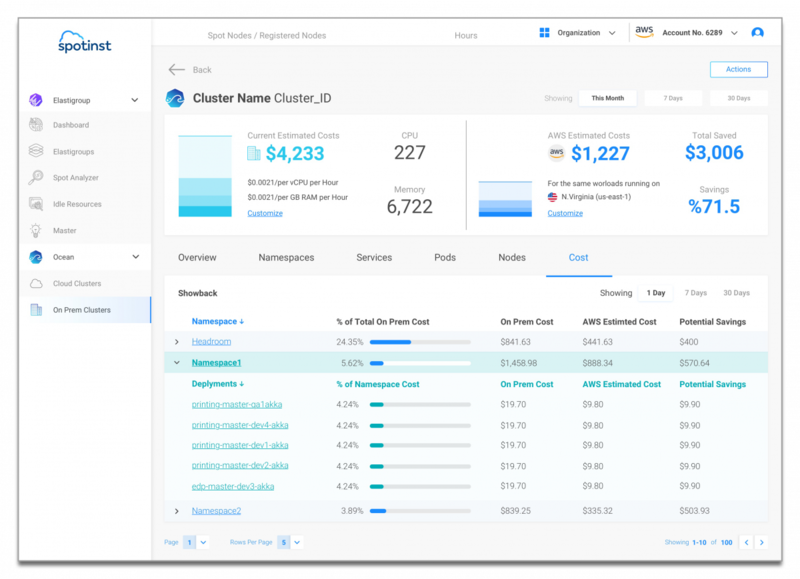 Besides helping organizations reduce costs on their cloud computing bill, Spotinst Ocean was announced and it is a game changer for Kubernetes users because it will allow them to intelligently autoscale their pods and underlying infrastructure autonomously. Want to learn more about Ocean? Check out our Product and Documentation pages. To catch the latest Spotinst News, please visit our news site.